SAUDI ARABIA – The Saline Water Conversion Corporation (SWCC) has signed an agreement to procure three floating desalination units set up on barges to provide a total capacity of 150,000 m3/d drinking water over a period of 20 years. 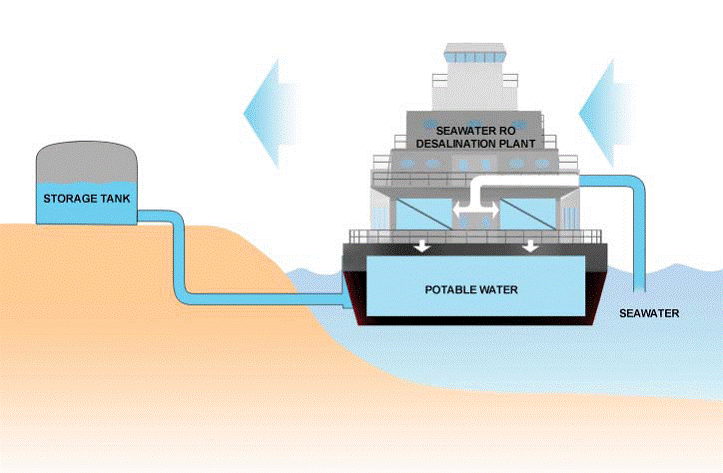 Each floating desalination plant will have a capacity of 50,000 m3/d. The barges will be able to be moved and stationed part of the country in case of an urgent water shortage. The floating desalination units will become operational in 15 months and will initially supply the Jazan and Asir provinces. Meanwhile, the Public Investment Fund (PIF) of Saudi Arabia has acquired a 15.2% equity stake in ACWA Power. PIF already holds a 9.78% stake in ACWA Power’s wholly-owned subsidiary Sanabil Direct Investments Company. PAKISTAN – The Cantonment Board Clifton (CBC) is lobbying the Sindh government to install a desalination facility that would alleviate the continuous water shortage in Defence, a neighborhood located in the city of Karachi. According to the CBC’s Vice-President, the Pakistan Peoples Party has plans to install a desalination unit in Defence if it comes to power again. He also stated that CBC itself is considering building a 94,000 m3/day desalination plant that would benefit both Defence residents and District South. USA– According to a new study by MIT scientists, brackish groundwater is a major untapped resource for many of the increasingly water-challenged regions of the U.S. and the wider world. The quantity of brackish groundwater in the U.S. far exceeds that of groundwater extracted nationwide. The MIT study correlated the locations in the U.S. of usable brackish groundwater sources with the greatest water-stressed areas and found specific locations with both a high need for water and high availability of treatable brackish water. These areas included parts of southern California, Arizona, and certain regions across the upper Midwest. The researchers had a less complete dataset for other countries, but their findings suggest that U.S. trends in treatable brackish water are similar across the world. “Al-Fadli signs deal to set up 3 floating desal plants”, saudigazette.com.sa, July 5, 2018. <http://saudigazette.com.sa/article/538289/SAUDI-ARABIA/Al-Fadli-signs-deal-to-set-up-3-floating-desal-plants> accessed July 9, 2018. PIF will now hold 24.98 percent equity interest in ACWA power. Saumy Prateek “Saudi Arabia’s Public Investment Fund Acquires 15.2% Stake in ACWA Power”, mercomindia.com, July 6, 2018. <https://mercomindia.com/saud-arabia-pif-acquires-stake-acwa-power/> accessed July 9, 2018. “CBC lobbying next govt for desalination plant”, thenews.com.pk, July 2, 2018. <https://www.thenews.com.pk/print/336086-cbc-lobbying-next-govt-for-desalination-plant> accessed July 9, 2018. David L. Chandler “Study finds potential in brackish groundwater desalination”, news.mit.edu, July 4, 2018. <http://news.mit.edu/2018/study-finds-potential-brackish-groundwater-desalination-0705> accessed July 9, 2018.